← There’s a Mexican on the Cover of ‘Le Monde’ Magazine! 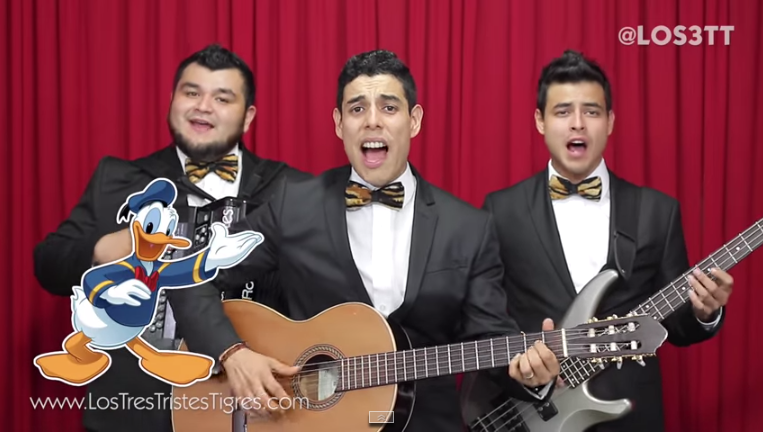 Hilarious Mexican trio Los Tres Tristes Tigres have done it again. Here’s their Donald Trump corrido –in Spanish and sans musical arrangements, because, really, he doesn’t deserve it. IMPORTANT NOTE: I’m still on vacation so I won’t bother translating this thing right now, though I might do so as soon as I’m off this Greek island….or not. This entry was posted in 2016 presidential campaign, Corridos, Latin America, Mexico, Why I Love Mexico and tagged corridos, Donald Trump, DumpTrump, los tres tristes tigres, música mexicana, Mexico. Bookmark the permalink. those boys are some very talented homosexuals.